The chief executive of the Food and Drink Federation (FDF), Ian Wright, has written to all MPs regarding potential Brexit options and what the consequences of those options might be for the UK food and drink industry, the UK’s largest manufacturing sector. 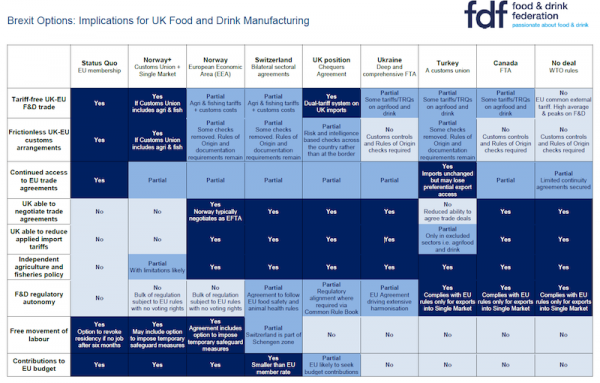 Below is his letter and a table setting out the different Brexit options and their consequences for UK food and drink. I am writing to you and every other MP on behalf of the UK’s largest manufacturing industry. Every constituency in the country has a substantial number of voters employed in the food and drink sector. It is an industry at the bedrock of our national life. Food is a matter of national security. Government’s first duty is to feed the country – if you can’t feed the country you don’t have a country. The choices you make in tonight’s indicative votes and in the meaningful vote whenever it comes will have profound consequences for our food supply. Some of the options being debated will constrain the vast array of choice to which UK shoppers – every one of your constituents – have become accustomed to over the last four decades. I am quite sure you will not want to explain to them in years to come why you have opted to restrict the supply of their favourite food – or to increase its price. Yet those could easily be the consequences of making the wrong choices today. If you have any questions or want further information from the FDF on Brexit, please email debbie.mccreath@fdf.org.uk. The table is also attached in PDF format, if this format is preferred.